The organized way to play, store, and travel with small toys. We handpicked this because play for hours, clean up in seconds—sounds like a dream come true. The Lay-n-Go Lite is an 18-inch durable, water-repellent toy satchel that lays out completely flat, then cinches up for quick and effortless clean-up of small toys. Kids can tote it when playtime is done to keep all those little toys neat and tidy. This innovative storage and travel solution also makes a convenient activity mat that kids can keep their toys on for organized fun at restaurants, on airplanes, in cars, at Grandma's house, or just about anywhere. Make it easier for your kiddo to keep new little toys from scattering all over the house with the Lay-n-Go Lite. The Lay-n-Go® LITE (18") is a patented high quality personal activity play mat. Grab and Go! Take your small toys on an airplane, in a car or to a restaurant... your activity travels with you anywhere! No more dumping bins and baskets. The patented raised lip keeps Lego® and other small pieces contained on this personal activity mat. Pull the drawstring, and the Lay-n-Go® LITE completely closes for storage and travel. The Lay-n-Go® LITE is a smart and easy 4 in 1 solution... activity mat, cleanup, storage, and carry-all in one. Grab and Go! Easily take your small toys anywhere! Raised lip keeps toys on the mat for hours of play. Lay-n-Go was created by a mom and dad team. Mom, who loved all her kids’ incredible mind building toys with small pieces, needed an easier solution to clean, contain, and manage the chaos. 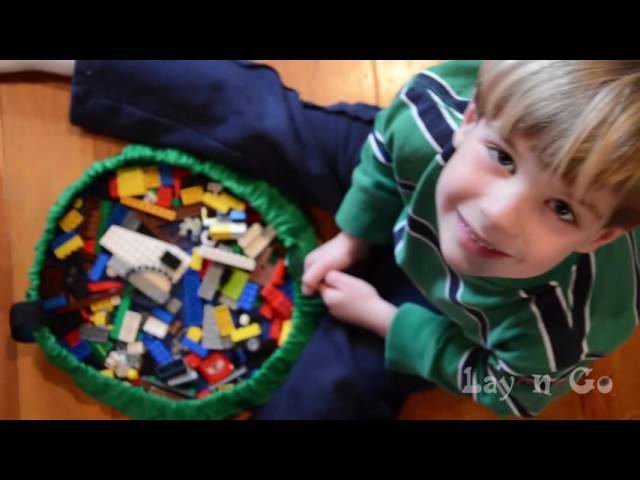 Dad had a passion for LEGO, and wanted to pass on that passion to his own three sons.